Epoch 5 Public Relations Vice President Kathleen Caputi has been awarded the PR Campaign of the Year Award from the Public Relations Professionals of Long Island for demonstrating creativity, strategy, ethics, and a positive outcome for the agency’s Journeys to School campaign, sponsored by Transdev. The highlight of the campaign was a major kick-off event at the United Nations in New York City hosted by Secretary-General Ban Ki-moon. 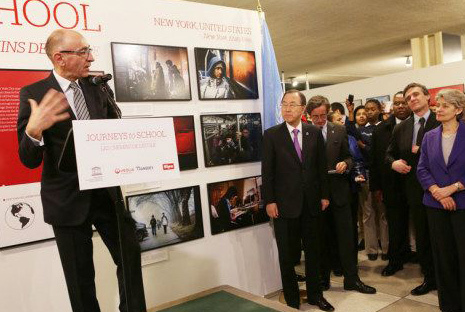 Transdev CEO Jean-Marc Janaillac (left) speaks at the United Nations premiere as U.N. Secretary-General Ban Ki-moon (center) and UNESCO Director-General Irina Bokova (right) listen. Kathleen headed media outreach for the world premiere of the international photo exhibit, Journeys to School, at the United Nations. A joint project of the United Nations Educational, Scientific and Cultural Organization (UNESCO), Transdev — an international transport company — and the French photographic agency Sipa, Journeys to School documents the difficult and often treacherous paths to school taken by children around the world. Epoch 5 secured significant media coverage, including broadcast coverage by WABC-TV and NY1, print coverage in New York Post, NY Daily News, Newsday, radio coverage on NPR’s Transportation Nation, online coverage including The New York Times/WNYC’s Schoolbook, and much more.